That’s some of the soundest advice old Dad could ever give a new, young driver. While it may sound harsh, the gist of this dry, and regrettably more often than not, true mantra is that vehicles will inevitably live a good life and inevitably need some maintenance. Common vehicle problems associated to wear and tear is part of the responsibilities of being a vehicle owner, and there’s little you can do to fully prohibit the odd trip to the garage. But that’s okay, because a pro-active outlook on this can save you time and money. That said, there’s lots you can do to fend off little issues that can, over time, develop into large problems. This approach to regular and consistent maintenance is key to ensuring that you avoid and catch potentially damaging and problematic repairs before they happen. 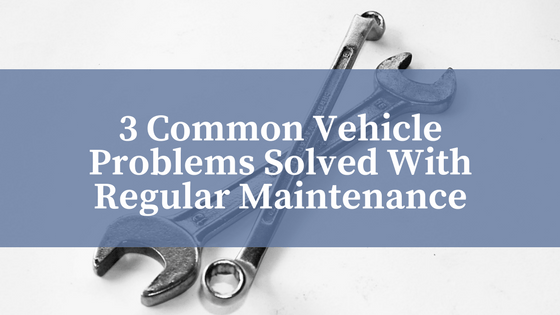 In this guide, we’ll tell you about three common problems that can be solved ahead of time by regular maintenance. If there were a 10 Vehicle Commandments list written in stone somewhere, oil changes would probably be #1 on that list. Thou Shalt Not Skip an Oil Change. When you drive your car regularly, you’re helping to set a benchmark of when your vehicle requires maintenance. That sticker above your head in the left corner of the windshield is your ticket to avoiding running your engine out of oil, causing detrimental damage to intakes, pistons, and cylinder walls – often resulting in seized engines. Aside from keeping the engine well lubricated, the underside of your vehicle rarely is seen by the eyes of humans. Getting your oil checked regularly allows a mechanic to view and potentially catch any upcoming repairs early on, helping you save money and time. They can let you know if something needs to be replaced, tightened up, or requires an in-depth maintenance appointment. Getting your oil changed by your trusted dealership is one of the best ways to eliminate the headache or costs associated with engine seizures, or other kinds of internal damage. Brakes are good things, because they allow you to stop your vehicle safely. Sound silly? Maybe, but that’s because of the implied obviousness of the statement. Brakes are the primary safety feature of your vehicle and require constant maintenance – because friction is their primary function. That means that over time, your brakes wear away when they do their jobs. Regular maintenance helps your mechanic to decide when you’re better off getting them replaces ahead of time. Pushing the brake pedal is all part of a very complex system. Maintenance could mean swapping out or topping up your hydraulic brake fluid, replacing any number of brake components – shoes, rotors, calipers, discs, cables, etc – or upgrading your brake system after a long season of towing a boat, motorcycle, or trailer. As part of a good annually administered maintenance routine, rust-proofing is often neglected – but can help you save thousands on your vehicle as time goes on. Harmful chemicals on the roadways, especially in Canadian winters like sand and salt, can have detrimental effects on the metal body of your vehicle, as well as the undercarriage, frame and exposed engine components. Metal corrosion is an electrochemical reaction that causes on average, $34 billion dollars of damage in North America alone, according to CAA. The insurance guru’s note de-icing chemicals and products have increased in use over the last decade ten-fold, meaning the lifespan of our vehicles is significantly reduced when we do not take action to maintain and protect them. Applying an annual Krown application can lengthen your car’s lifespan by over 3 years, and keep it out of the junk yard. Most rust-proofing maintenance packages include an undercoat oil spray that helps to protect and shed water and salt from the metal components of your vehicle prolonging the health of your vehicle’s structural and aesthetic integrity. It can also extend the life of smaller repairs, like brake lines, fuel lines, and sensors. In short, yeah – vehicle’s may degrade over time and this is natural, but there are many ways that responsible and pro-active owners can prolong the lifespans of their vehicles in order to fend off costly repairs. Regular maintenance has the power to solve hundreds of potentially detrimental problems associated with your vehicle, so don’t neglect to check early, and check often.